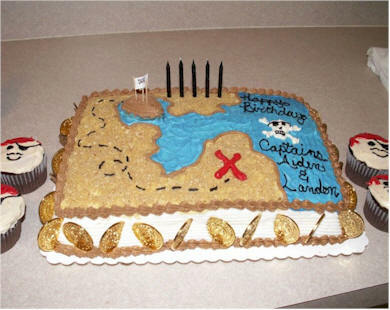 Set sail for a fun adventure with these Treasure Island birthday party ideas. Cut out five large shapes out of poster board - about 12“ x 14“. Decorate them to look like small islands. Tell the pirates they must use only these five islands to get from one end of the room to the other (or if playing outside make the space at least 25 feet). They must take the four pieces and move their team by having everyone stand on the pieces together, taking the back piece … moving it to the front and so on. If they step in the “water” then they must start at the beginning. No one can be left behind - they must all move together. Teams race using treasure island pieces to move from one area over to another area. Teams only have one more piece then the total number of kids on their team to play the game with. Give teams pieces of paper (these are the islands). The treasure hunters have to line up in a line and put the pieces one in front of the other while they stand on them - moving the back island piece to the line's front so they can move forward. Make 2 "Ships" from cardboard boxes or plywood (decorate, name and cutout portholes) Place in yard facing one another with a large blue tarp in between for water. Divide kids into 2 teams and provide with cannonballs (100+ black water-filled balloons!) Let the chaos ensue!! If you don't want to use water balloons make cannons out of balled up newspaper wrapped in black hockey-tape. Make a fun pirate party invitation by drawing a treasure map (a map of your neighborhood made to look like an island with an X to mark the spot of the party location) and then below it printing the party information on parchment paper. Then very carefully burn a little bit of the paper all the way around the edge. Large brown grocery bags will also make a great looking invitation done the same way. Attach party information to a bag of chocolate gold coins. Another fun invitation idea is a message in a bottle. Collect empty water bottles and remove the label. Fill with a little sand and a few shells - then place the invitation (or you could put in a treasure map) inside. Put the cap on and hand out to invited guests. Make an invitation that looks like a treasure chest or large gold coin. Make the party entrance look like a treasure map by placing 8 - 10" strips of black duct tape in a broken line starting at the curb and looping around the walk up to the front door. 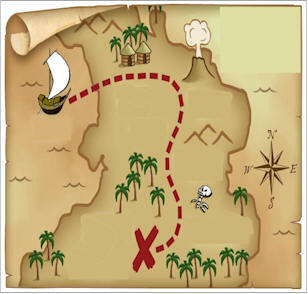 Decorate the Treasure Island with palm trees, sand, treasure chests and gold coins. Sprinkle sand and chocolate foil wrapped coins on the party table. Serve snacks in giant seashells. Hang fishing nets from the walls. It wouldn't be a Treasure Island party without a treasure hunt! Make clues that lead the treasure hunters from one area of the house to the next. The clues should be hard enough that they have to think, but easy enough for children to figure out. To make the treasure hunt last longer we always make the guests do a challenge or game to get the next clue at each station. Once they finish the challenge then they get the clue to the next destination. Some great activities and challenges would be: Gold Coin Toss - Guests must toss coins into a treasure chest before they can get their next clue. Parrot Piñata - Fill the piñata with candies and small prizes and a clue to the next location on the treasure map. Let the pirates take turns trying to open the piñata. Make all the party guests complete the obstacle course before they can get their next clue and move on in the treasure hunt. Set up the course using anything you have on hand such as a swing set, trampoline, garden hose, empty cardboard boxes etc. Paint small wooden treasure chests. Buy several styles of wooden treasure chests and let the party guests paint them and embellish them with stick on jewels when the paint is dry. Make Treasure map mini pizzas - on the crust use cheese as sand, strips of red bell pepper as the "X", slices of black olives for the broken line trail that leads to the "X", green pepper strips for palm tree leaves and sausage for rocks or mountains. Macaroni & cheese using the Shells style of pasta. Goldfish crackers in upside down pirate hats. Fill small clear plastic cups with blue Jello - add Swedish fish candies. Octopus Hot Dogs - cut hotdogs long ways into 8 strips … leaving 1” at the end uncut. Place in the microwave to heat - the 8 hotdog “legs” will curl up while cooking and will look like an octopus. Take brown lunch sacks and crumple them into a ball ... then lay out flat. Attach a thank you note made from red scrapbook paper.